The Old Gray Lady and streaming service have teamed up. There have been many a call on social media for folks—chiefly of liberal ilk—to subscribe to newspapers and other publishers to fight “fake news.” Such rallying cries usually point out that national papers like The New York Times and The Washington Post need support for more investigative reporting during this politically charged era. Well, the Times just sweetened the pot: Readers who fork over $260 annually for access to its digital edition will also receive a subscription to Spotify Premium, an ads-less music service that typically costs $120 per year. The news-plus-music deal costs $5 a week, representing a 20 percent retail discount for all-access to the Times’ digital content. To purchase the offer, consumers have to commit to one year and live in the United States. After the first year, though, the cost goes up—NYT-Spotify subscribers will be charged $6.25 per week, or $325 annually. 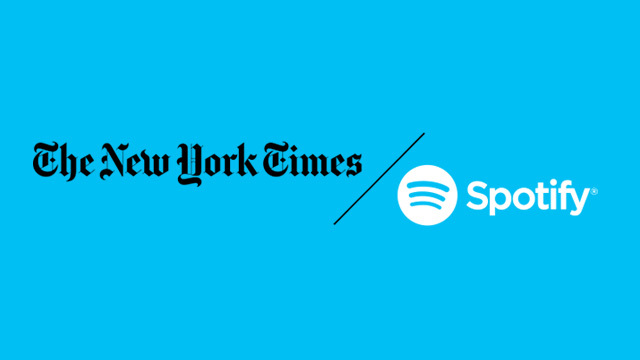 It will be interesting to see, in future months, whether many Spotify Premium users cancel their subscription in favor of the new NYT-Spotify package. As of last year, Spotify Premium had more than 40 million paying subscribers worldwide.